Election Season is in full Summer swing, so Ward 5 Online just wanted to remind residents that candidates will be door-knocking and dropping palm cards! Be sure to ask questions and take the opportunity to discuss your concerns with them! The SomerMovie Fest schedule has been posted and the 2013 selections are great! July 11 - Jurassic Park, July 18 - The Fugitive, July 25 - Sleepless in Seattle - at Conway Park, August 1 - Philadelphia - at Powderhouse Park, August 8 - Free Willy - at Harris Park (Cross Street north of Broadway, August 15 - So I Married an Axe Murderer, August 22 - The Secret Garden, August 29 - Viewer's Choice: one of Cool Runnings, Groundhog Day, Nightmare Before Christmas, or Rudy. 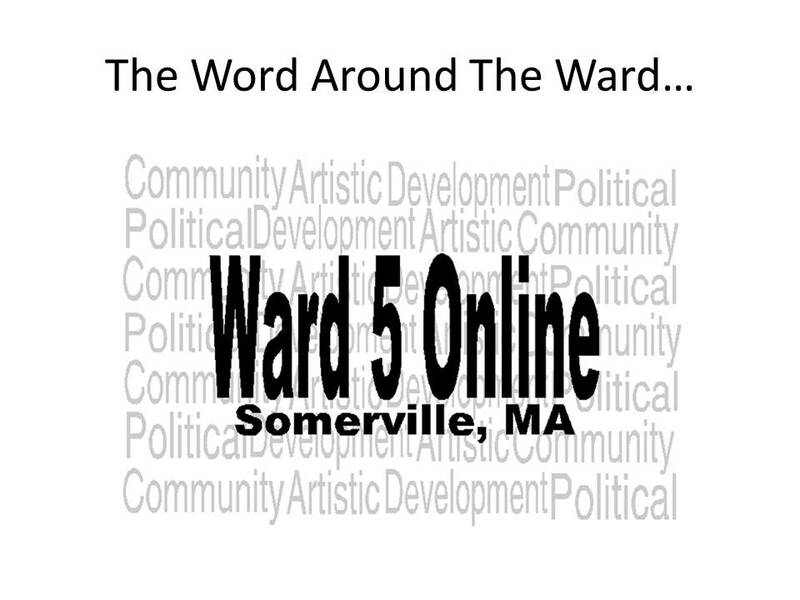 Ward 5 Online would like to extend a big, sad goodbye to long-time Gouners, Jen and Kelsey, who just purchased a condo in Malden. Jen and Kelsey were passionate Magoun Square patrons and dedicated readers and commenters on this website. Good luck and congratulations on your new place! PennyPackers will be in front of the licensing commission as they seek a common victualer license on July 15th. PennyPackers owns two food trucks stationed in Boston and are in the process of opening a brick and mortar in Magoun Square. Also in front of the Licensing Commission with be the Arts at the Armory answering to violations committed in the past few months. This meeting will be held at 6pm in the TAB Building (167 Holland Street). Two new businesses could be coming to Magoun Square according to last night's Zoning Board of Appeals agenda that had scheduled hearings for an ice cream shop/bakery for the (forever vacant) 517 Medford Street, as well as, a new fast food venture for 498 (K2 Beer and Wine-first door) Medford that is rumored to be Chinese take-out. More details to follow. While I was all in favor of the wing place and PennyPackers, the square alread has two Chinese places. I mean, good luck to them, but unless they manage to be something very special I think they might have a hard time of it. I also wish the owner of K2 asked residents what they wanted instead of just putting someone in there. Oh well, if he fails, I would like to give Raul my 2-cents about what I would like in there. I think I follow the new owner of the ice cream place on twitter. Again...so happy this feature is back!! Hurray for Pennypackers and ice cream/bakery! But we seriously don't need another Chinese food place.